The traditional desktop computing paradigm has had major successes. It also should be noted that we are in a day and age where many good computer and device users are increasingly finding themselves being required to perform their activities not in offices/desktops but in real-world settings. Ubiquitous computing can make possible in the real-world setting what would have otherwise been impossible through desktop computing. However, there is a world of difference between the real-world and the desktop settings. The move from the desktop to the real-world settings raises various issues when we consider the nature of tasks that the ubiquitous devices/applications would be expected to support and the real-world context in which they will be used. A careful study of the nature of tasks in ubiquitous computing can make some design requirements in the development of ubiquitous applications more evident. 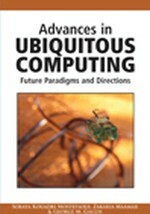 This chapter proposes ubiquitous application design and evaluation considerations emerging from a deeper understanding of the nature of tasks in ubiquitous computing.